The author Frank Hazzard nicely agreed to share this article with me after I contacted him. It is really well written. Frank Hazzard, a Columbia native residing in River Hill, has a background in journalism and event promotions. He co-owns Buzzquake Marketing, LLC, and specializes in content marketing that attracts prospects to websites and converts them to customers, buyers, members, sponsors and financial contributors. You may reach him at frank@buzzquake.com. Immigration has emerged as one of America’s preeminent issues. As such, I have been giving it quite a bit of thought lately, and have concluded that as a natural-born American my opinions might lack perspective. 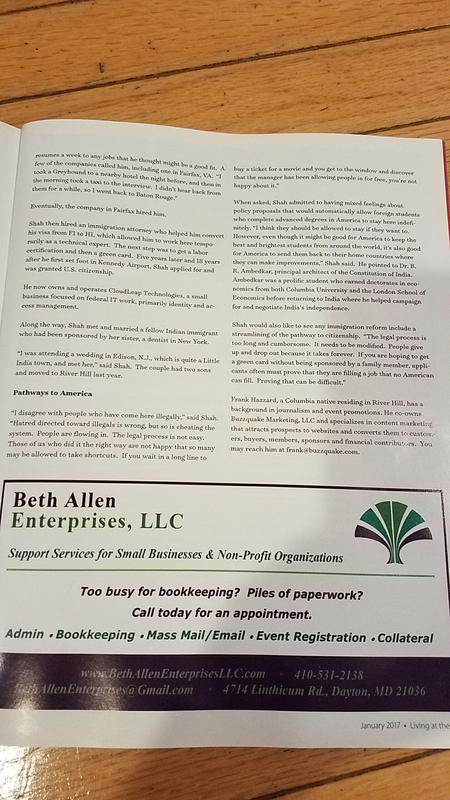 So, I sought a River Hill resident who might be able to help me understand how immigrants view immigration, especially illegal immigration. I found a willing participant next door in the person of Prashant Shah. I sat spellbound as Shah, a first-generation American who immigrated from India as a young man, shared an inspiring tale. Born in Gujarat, a small village on the west coast of India, Shah moved to Mumbai at a young age. He then attended a boarding school beginning at age 10. Ironically, his boarding school was owned by Zoroastrians, or Parsis, who were descendants of Iranians who settled in India to escape persecution. For the next eight years, he saw his parents only twice a year on vacations. He was a good student and went to college to continue his education. At the time, the only viable, professional career paths for young Indians were medicine and engineering. 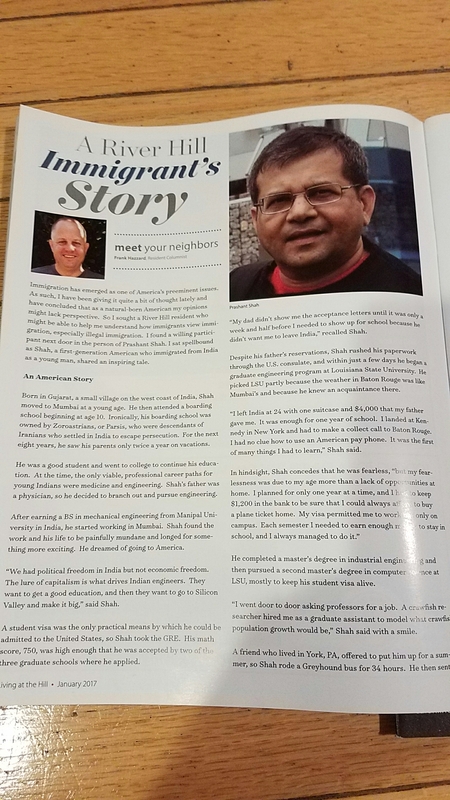 Shah’s father was a physician, so he decided to branch out and pursue engineering. After earning a BS in Mechanical Engineering from Manipal University in India, he started working in Mumbai. Shah found the work and his life to be painfully mundane and longed for something more exciting. He dreamed of going to America. “We had political freedom in India but not economic freedom. The lure of capitalism is what drives Indian engineers. They want to get a good education and then they want to go to Silicon Valley and make it big,” said Shah. A student visa was the only practical means by which he could be admitted to the United States, so Shah took the GRE. His math score, 750, was high enough that he was accepted by two of the three graduate schools where he applied. “My dad didn’t show me the acceptance letters until it was only a week and half before I needed to show up for school because he didn’t want me to leave India,” recalled Shah. Despite his father’s reservations, Shah rushed his paperwork through the U.S. consulate and within just a few days he began a graduate engineering program at Louisiana State University. He picked LSU partly because the weather in Baton Rouge was like Mumbai’s, and because he knew an acquaintance there. “I left India at 24 with one suitcase and $4,000 that my father gave me. It was enough for one year of school. I landed at Kennedy in New York and had to make a collect call to Baton Rouge. I had no clue how to use an American pay phone. It was the first of many things I had to learn,” Shah said. He completed a master’s degree in industrial engineering and then pursued a second master’s degree in computer science at LSU, mostly to keep his student visa alive. “I went door to door asking professors for a job. A crawfish researcher hired me as a graduate assistant to model what crawfish population growth would be,” Shah said with a smile. Eventually the company in Fairfax hired him. Shah then hired an immigration attorney who helped him convert his visa from F1 to H1, which allowed him to work here temporarily as a technical expert. The next step was to get a labor certification and then a green card. Five years later, and 18 years after he first set foot in Kennedy Airport, Shah applied for and was granted U.S. citizenship. He now owns and operates CloudLeap Technologies, a small business focused on federal IT work, primarily identity and access management. Along the way Shah met and married a fellow Indian immigrant who had been sponsored by her sister, a dentist in New York. “I was attending a wedding in Edison, N.J., which is quite a Little India town, and met her,” said Shah. The couple had two sons and moved to River Hill last year. When asked, Shah admitted to having mixed feelings about policy proposals that would automatically allow foreign students who complete advanced degrees in America to stay here indefinitely. “I think they should be allowed to stay if they want to. However, even though it might be good for America to keep the best and brightest students from around the world, it’s also good for America to send them back to their home countries where they can make improvements,” Shah said. He pointed to Dr. B. R. Ambedkar, principal architect of the Constitution of India. Ambedkar was a prolific student who earned doctorates in economics from both Columbia University and the London School of Economics before returning to India where he helped campaign for and negotiate India’s independence. Cool story. I know Frank Hazzard so it was fun to read.